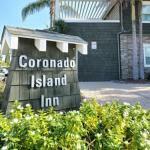 Featuring barbecue facilities and a garden Coronado Island Inn is set in San Diego. This 3-star hotel offers a 24-hour front desk a concierge service and free WiFi. Attractions in the area include San Diego Convention Center 1.7 km away or Downtown San Diego located 2.3 km from the property. Balboa Park is 5 km from Coronado Island Inn while Old Town San Diego State Historic Park is 7 km away. San Diego International Airport is 5 km from the property.